Over the past decade energy drinks have become a major craze amongst young adults and teenagers, a simple substitute for the age old coffee beverages that are widely used amongst older generations. In the past people would mix coffee with alcohol, sometimes known as an "Irish Coffee" or "Spanish Coffee." Today’s generation would rather mix their alcohol with energy drinks like Red Bull or RockStar energy drinks, giving one the feeling that the effects of alcohol are dulled by the energy achieved from the stimulant beverage - thus allowing one to drink more for a longer period of time. 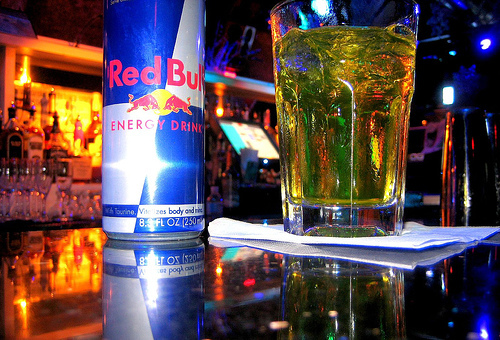 Unfortunately, such practices can be create a lethal cocktail as seen by the rise in emergency room visits associated with mixing energy drinks (stimulants) with alcohol (depressants). This fact has been backed by a study conducted by multiple private parties, schools of higher learning, and the government. Combining the two beverages can be particularly dangerous, according to a new report published in a pediatrics journal, CBS News reports. Last month, a government report released found the number of emergency room visits involving energy drinks doubled from 2007 to 2011, reaching more than 20,000. The report, from the Substance Abuse and Mental Health Services Administration (SAMHSA), found most cases involved teens or young adults. SAMHSA calls consumption of energy drinks a “rising public health problem.” About 42 percent of emergency room cases in 2011 involved energy drinks combined with alcohol or drugs such as Adderall or Ritalin. “They contain too much caffeine and other additives that we don’t know enough about. Healthy eating, exercise and adequate sleep are better ways to get energy,” said lead author Dr. Kwabena Blankson, a U.S. Air Force major and an adolescent medicine specialist at the Naval Medical Center in Portsmouth, Virginia. The majority of teens are not aware that mixing alcohol and energy drinks can make them feel less drunk than they actually are, the study showed. They wrote that drinking just one caffeinated beverage mixed with alcohol can be equivalent to drinking a bottle of wine and several cups of coffee. A 16-ounce energy drink has about 160 milligrams of caffeine, compared with 100 milligrams for an average cup of coffee. Dr. Blankson stated that a teen should not have more than 100 milligrams of caffeine daily, especially when mixed with the other energy drink additives like sugar, ginseng, and guarana which increase caffeine’s effects.